If you're new to Docker, it may be helpful to read the overview of QuantRocket's architecture before starting. Visit Docker's website and follow the instructions to download and install Docker Desktop on your computer. Docker will prompt you to create a free account. After the installation, start Docker Desktop if it isn't already started. By default, Docker Desktop uses 2 GB of your system memory. Giving Docker at least 4 GB of memory is recommended for QuantRocket. Generally, reserve at least 4 GB for your operating system or your computer might be sluggish. This means your computer should have a minimum of 8 GB of memory. If you plan to collect minute data, 8-12 GB is recommended for Docker (12-16 GB total). The more memory you give Docker, the larger the backtests and data analysis you can do. 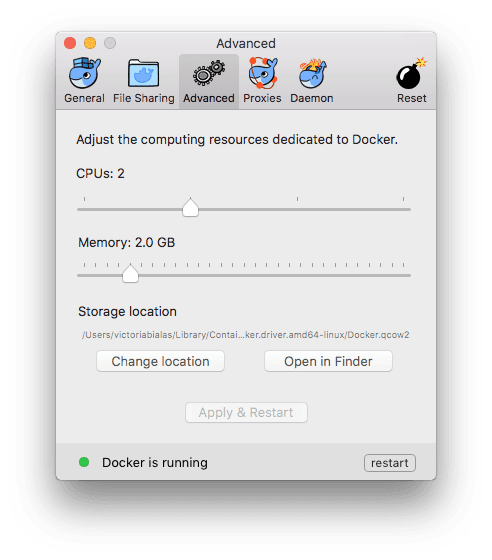 To adjust Docker's memory setting, click -> Preferences in the menu bar, then click Advanced and adjust the Memory slider to the desired position. To install QuantRocket, download a Docker Compose file which tells Docker how to create the QuantRocket stack. A Compose file is a YAML file that defines a multi-container Docker application. On your Mac, open a Terminal (Applications > Utilities > Terminal). You may want to bookmark this URL.